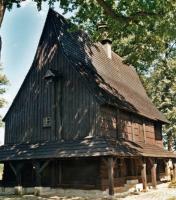 The Wooden Churches of Southern Malopolska are medieval Roman Catholic Gothic churches built in the horizontal log technique. 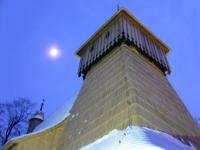 Southeastern Poland holds two sets of WH-listed wooden churches, which lie in overlapping areas. It’s an important travel decision whether to mix them and take in as many as possible while driving the most efficient route, or to separate them which also means not being able to visit every single one. I opted for the latter, as I thought otherwise the two sets would blur into one in my memory. I had about 1.5 days to spare in the area, and devoted the first afternoon to two of The Wooden Churches of Southern Malopolska. The most difficult thing about visiting any of the wooden churches is just finding them. I immediately ran into trouble with the first one, the church in Lipnica Murowana. Lipnica is a pretty cute and sizeable town, where in the center I noticed a sign pointing to the "Church of St. Leonard” rightaway. However, when I entered the indicated street I ended up at a large modern church. I wondered how this could have the same name as the old wooden one! I checked my notes for more clues, and even burned some data on my smartphone to find location details or photos of the surroundings. One of the earlier reviewers wrote about “somewhere northeast of the center, with a large cemetery”. Driving around I found a small church within a big cemetery - but it did not look that old nor made out of wood. I was finally rescued by the waitress from the pizzeria at the central square: "Oh, it's right around the corner and then 200 meters further." It turned out that I had already been close to the right spot in the beginning, and only had to follow the path for a few hundred meters more. Fortunately it was worth all the effort: the St. Leonard Church of Lipnica Murowana is idyllically located between the trees next to a river . A group of folk singers in traditional costume were just about to burst into a song when I arrived, they were being filmed with the church in the background. Some other visitors had already dialed the phone number pinned to the church door. The woman with the keys duely arrived, and let us in. This church is best known for its paintings on the wooden walls. On one side even a version of the Last Supper is depicted. The ceiling, pulpit and musicians’ choir are also covered in polychrome painting. The second church on my list was the one in Binarowa , about an hour away. This church is signposted practically all the way ánd lies along the main road in the village - so no more searching. But I encountered another hurdle: there was a wedding ceremony going on. The doors were open and I could peek inside, noticing a rather glitzy baroque interior. Unfortunately I could not see anything of the “stencilled painted decorative scheme” that is said to be a unique reminder of Late Medieval Europe. I did not want to spoil the wedding day of Adam and Yolanda - I overheard the priest calling their names via the loudspeakers that were in use for those congregants waiting outside. As often, the nomination file provides great reading material with more than you ever wanted to know about wooden church construction. The file features 9 churches, of which only 6 went on being inscribed. They were built thanks to influential and wealthy sponsors, who tried to emulate the gothic building styles of the city churches using the locally widely available natural resources of timber. If you’re in the area they certainly warrant a visit, but among the 5 groups of Eastern European wooden churches on the List I rate them the lowest (my favourite may be the Churches of Peace). Three separate World Heritage sites in one region with a total of thirty individual sites - much ado just about wooden churches? At least these were my thoughts before we planned our trip to Lesser Poland and Slovakia in August 2014. But while reading the nomination documents and viewing the pictures to decide which of the sites might be worth a visit, I started to change my mind. And after we visited the first two or three, these lovely wooden churches had won me over. Finally, we visited eighteen of them, several more than we initially had planned. All churches have in common a striking architecture and an enchanting interior with colourful paintings on the walls and ceilings. And they are located in beautiful rural settings, behind trees and surrounded by meadows. But this also means that most of them are in a rather remote area, thus I would endorse the recommendation by Clyde to use a navigation system and to previously check the coordinates in Google Maps or Google Earth. Despite the obvious similarities between the three nominations there are distinct differences in architecture and interiors. The characteristic features of the churches included in the Southern Malopolska WHS: the nave and the chancel have a tall gable roof with a small bell-turret on top, on the west side is a tower with the main portal, and most of the churches are surrounded by (open) arcades called sobots. The tower is not or only marginally higher than the main roof. We had different experiences in terms of access to the interior, entrance fee and photo permit. In Poland, the entrance was free in most cases, sometimes we had to pay a fee for taking photos, but we always made a donation or bought a booklet or a postcard, I think that's appropriate, in particular because I took a lot of photos. Blizne (photo): my favourite among the sites of this WHS; the exterior is very harmonious, surrounded by a wooden fence with several stone shrines, no arcades; the interior is entirely covered with paintings and floral motifs even the pews and the tiny pulpit; the church was closed when we arrived, but other visitors already had called the phone number of the rectory, and a few minutes later a friendly young man (the priest himself?) came and opened the door; no photos allowed, but we took a few photos through the lattice door. Sêkowa: the special feature of the exterior is the open ground floor of the tower; the interior has only little decoration, because the church was destroyed during WWI and the interior fittings and the wood of the walls with the original paintings were lost; it was closed when we arrived, but a kind man from the neighbouring house organized the key for us. The WHS comprises six churches from the 15th and 16th century, three others were rejected. According to the advisory body evaluation mainly because they are more recent, from the 17th and 18th centuries. However, the inscribed churches underwent several changes over the centuries, the towers and arcades are later additions and also several of the paintings and sculptures are Baroque. Of the rejected churches we visited the one in Orawka, it was on our route from Slovakia to Krakow, the only substantial difference to the inscribed sites was the addition of a brick-built chapel. I visited this WHS in September 2014. I visited 5 out of the 9 wooden churches of Southern Malapolska and managed to enter 4 of them to see the frescoes and paintings. I combined this WHS with the Wooden Tserkvas of Poland and I dedicated a full day driving from one wooden church/tserkva to the next. In a way they reminded me of a similar "treasure hunt" experience I had when visiting the churches in Val de Boi, Spain. I really enjoyed myself but I managed to visit so many churches only because I had done my homework beforehand. First of all I searched the churches/tserkvas on Google Maps to get an idea of their location. This helped me to decide on a logical order to visit the churches. Next, I entered their exact location (longitude/latitude) on my GPS which turned out to be a very wise idea as most of the wooden churches are well hidden behind tall trees and signs were non-existant. I got this information from http://whc.unesco.org/archive/2002/noms/1053.pdf. Then I wrote down Poland's telephone code (0048) as I knew I would be needing it to be able to call the church keyholders once I got there. 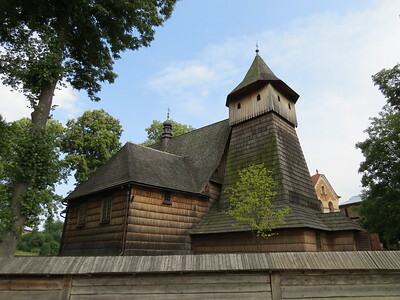 The first wooden church I visited was the one in Lachowice which is quite similar to the other 2 churches I visited in Lipnica Murowana and Sekowa. The former church was closed and the keyholder was nowhere to be seen or reached by mobile phone. I was luckier with the other 2 churches and after calling the keyholder (their number is affixed on the church door), somebody turned up to open the church and switch on the lights. Most of the keyholders didn't speak English and only some of them spoke some German but they will gladly give you laminated information sheets inside. All the churches I visited were free although I had read that sometimes a small amount is charged to visit the church in Lipnica Murowana. These 3 churches are quite similar. They are built using the horizontal log technique (like all these inscribed churches), however their peculiarity lies in the steep roofs reaching close to the ground. The other 2 churches I visited didn't have this peculiarity and they had a different shape altogether. 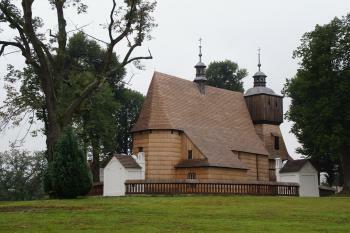 The church in Lipnica Murowana is the oldest inscribed wooden church and it houses the UNESCO WHS certificate inside. 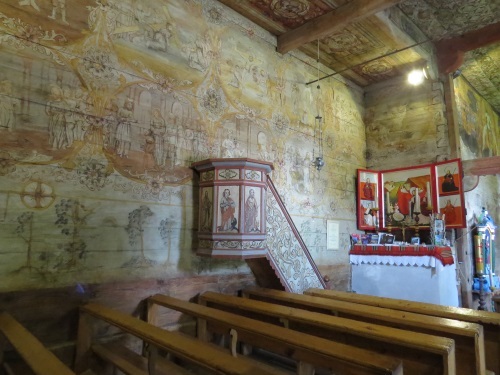 The interior wooden paintings are worth viewing and just behind the altarpiece there is a replica of the Pillar of Światowid, the only "remains" of an ancient pagan worship site on which this church was built. The original can be found in the Tarnów Diocese Museum. The church in Sekowa is the largest inscribed wooden church. The interior can be viewed through a barred iron gate or else just call the keyholder who will gladly open the door for a quick peek. The interior is not as interesting as the one in Lipnica Murowana. 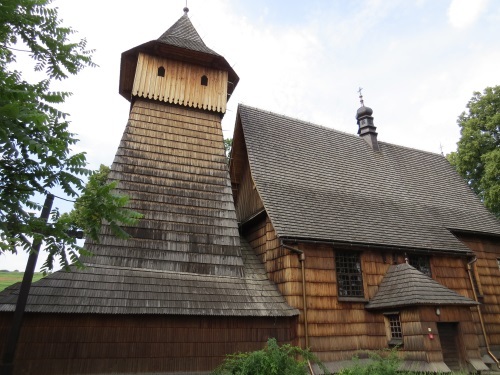 The next church I visited was the one in Binarowa (picture) and its peculiarity is the tower-like shape (similar to other inscribed wooden churches I didn't visit). The last church I visited is the one in Szalowa. It doesn't have any of the mentioned peculiarities and instead it has quite a conventional squarish architecture. There was mass going on when I visited so I couldn't spot anything of extraordinary interest inside. Most of these churches are too small for the present communities so some of them have rows of benches just in front of the main entrance so that everyone can be seated even if there isn't enough space inside the church. I wouldn't mind visiting the remaining inscribed wooden churches in the future although from what I read and saw, the most representative seems to be the one in Lipnica Murowana. Debno : reached by bus from Krakow, changing at Nowy Targ. The driver stopped outside the church car park, and the church was open to visits. Binarowa : reached by bus from Krosno, changing at Biecz. A service had just concluded and participants were spilling over the road when I arrived. I walked back to Biecz after my visit. Haczow (pictured) : reached by bus from Krosno. The church was open to visits although no one was around. Very nice churches with walls nicely painted. In some cases, are not easily reached by car since some signs are missing on the roads and polish people drive dangerously. Here, I'm talking about the other drivers if you rent a car and also the driver of your coach if you consider a bus or mini-bus trip to these places. 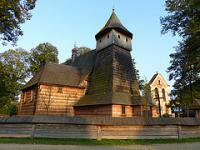 Wooden churches of southern Little Poland are immpressive places which are different from other major churches. Living belief can be seen here and being wooden architectures reminded me of power of nature. I've been to all six churches which was resistered,the Mass at debno made me immpressed at most.This photo is debno church at night. 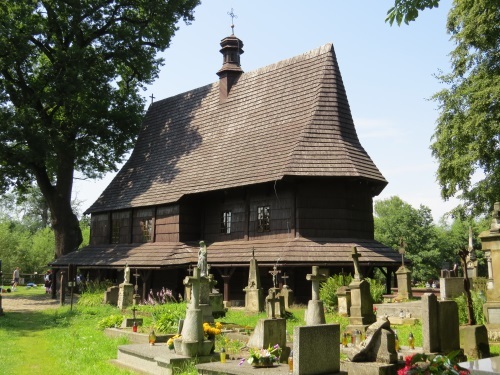 In our trip to Poland we have visited Lipnica Murowana and its wooden Gothic cemetery church of St. Leonard, constructed in 15th century outside the walls and reconstructed many times, in the horizontal log technique. It has a high roof with wooden shingles, an arcade around it and a nice portal. Inside there are wall paintings, polychrome decorations on the ceiling of the nave and of the chancel and a crypt with some tombs. I was a little bit disappointed by the church because I imagined it bigger and more spectacular or decorated and also because it was closed, even if its architecture is of very good quality. I think however that it justifies the inscription because there aren't many wooden churches on the WHL and especially because they are a very important and widespread type of traditional buildings, but in my opinion the inscription can be largest, as to comprend all or some of the many other wooden churches of Poland, and also transboundary (there are many other wooden churches in Hungary, Slovakia, Romania and Ukraine). The church is very well conservated and it has a high degree of authentity. The title of the WHS "Wooden Churches of Southern Little Poland" seems to be uncorrect, because two of the churches are in the region of Subcarpathia; but the title is referred to the historical region of Little Poland. The church is worth to be seen if you are in the surroundings of Cracow but it's difficult to get there. You can reach it from the road 4 going from Cracow to Tarnów by taking near Brzensko the road 99 in direction of Nowy S¹cz and taking near Tymova the road 966, on which Lipnica Murowana is; you can park the car directly in front of the church, but the road signs telling you how to reach it are hard to find even in the village, so ask someone where the church is. The Southern border of Poland with Slovakia contains wonderful unspoilt scenery and justifies detailed exploration by car and on foot over as many days as you can spare during a holiday to Poland – or even a journey for its own sake. The geography of the area has meant that a special culture has been developed and at least partly maintained. A major outward manifestation of this is the many wooden churches which dot the area. The road system is complicated as it follows valleys in and out of the Carpathian foothills – and the difficult-to-remember and pronounce (to non Poles!) region and village names make tracing a route even more complex. There are many more churches than the 9 inscribed on the WHS list and to find and see all of them would require many hours of poring over a map and many hours of driving. Some of the best e.g. Binarowa and Sekowa (photo) are in the “Beskid Niski” region near Gorlice (Poland’s “Oil town”).The churches are set in meadows and shady forests. Most have steep roofs which reach near to the ground, creating an overhang under which peasants who had travelled many miles to arrive on the Saturday evening ready for early Sunday mass could sleep! The interiors range from the simple to the quite ornate. We found services going on in some of them. All in all it was a very pleasant part of a visit to Poland. Although the WHS list is perhaps in danger of saturating the market for groups of Central European rural churches (there are also 3 sets in Romania with potentially more to come from the Tentative Lists of Hungary and Slovakia!) I wouldn’t argue against the inclusion of this group. You wouldn’t go to “Southern Little Poland” just to see these churches but, if you are there, you should try to see at least 2 or 3 of them. In late August 2000 I had the chance to visit family living in walking distance to St. Leonard Church in Lipnica Murowana. The church was open and we had the chance to see the beautiful artwork within it's walls. Simplistic in nature, this church was quite a wonderful find tucked away in a lovely village. From "Southern Little Poland" to "Southern Malopolska"
Built or owned by Germans: Hacz?w. In the 14th century there was a German settlement there called Hanshof.